Where would you go if you still had the imagination you had as a child? What would you do? This is the story of Luca, a young boy who does not want to go to bed, and each time his parents tell him to go to sleep he begins a new adventure, first as a pirate, then as a Knight, then as an archeologist then a desert trek, and finally a deep sea adventurer. This book is wonderfully written and incredibly illustrated. 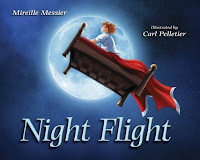 It's a fun story for the whole family and it will set your child's imagination on fire and maybe bring back some of yours from your childhood. This book continues shortly after The Hunger Games finishes. Katniss Everdeen and Peeta Mellark are back home in District 12 but things are not all joy for the victors. Katniss receives a visit from the President of the Capitol warning her that he knows all of her secrets, and during the Victory tour that she and Peeta must convince the other districts that their love is real. It is even announced on TV that their wedding will be hosted by the Capitol. However, all is not well in Penam. The last time there was a rebellion, District 13 was nuked from the map, and The Hunger Games began to remind the districts of their submission and subjugation to the Capitol in this new country of Penan in the ruins of former North America. The Capitol each year forces each of the 12 provinces to draw names of a male and female tribute. The tributes are drawn from all people between the ages of 12 and 18. They receive training, are assessed by the game masters and then the betting begins. The games will be televised and are required viewing for the whole nation. 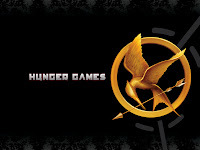 In book 1 Peeta and Katniss won the games, but angered many in leadership in the Capitol. Now is the beginning of the preparation for the 75th Hunger Games. It is a Quarter Quell; each 25 years the rules are modified. In previous Quarter Quells, on the 25th Anniversary of the rebellion, each district had to vote on what child to send to the games. In the second Quarter Quell, on the 50th anniversary each district had to send two male and two female tributes to the games and this time it is announced that the Tributes to fight in the games will be drawn from previous victors only. Katniss panics at this news; less than a year ago she had to fight to the death with 23 other youths. Now she must return to the Arena and the death and carnage it will entail, for she is the only female from district 12 to be a victor. And she will have to enter the arena either with Peeta or Haymitch, her former co-winner or her mentor. And this time the Capitol will not allow two winners from a district again. Her world has just been turned upside down. As she prepares to train to re-enter the arena, she must decide who and what she is willing to fight for and this time maybe die for. This book was so intense I could not put it down. I read it in one sitting, devouring it, then went back about a week later and reread it more slowly in case I missed anything. The cliff hanger is so extreme that even though it is more than a year away, I cannot wait for book 3 to be published. This book and the first The Hunger Games are excellent fictions and great summer or fall leisure reading. 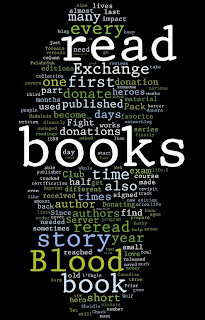 Confessions of a Bibliophile #7 - How do you treat your books? I have noticed that people treat books in many different ways, to write in them or not, to stamp or mark them, breaking the spine and many others. Over the years my habits in this regard have changed often. 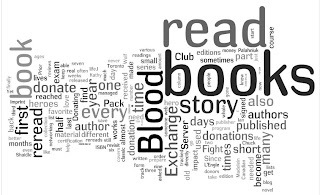 In this week's article we will examine the pros and cons of some of these habits in a reader. First, writing in books. This is a habit I tend to do in phases. When I am keeping all my books, or reading a book I am planning on reading a number of times, or if a book is really impacting my life, I tend to underline in the book and write notes in the margins. 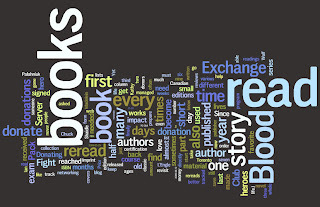 If it is a book I write in, I use a different color with each consecutive reading. An example is The Closing of the American Mind by Allan Bloom. This book came highly recommended to me my first year here at UWaterloo by Dr. Peter Frick. The first lecture my first term here Peter did a talk on theory of education, and why we are at university. He quoted from his version of this book that was so well worn it was held together with elastics. That first year back in 1998 when I read it, much of it was over my head, specifically some of the philosophy of education. That first year I underlined in red and made notes in the margins. I have since reread the book 3 more times and each time I have understood more of the book, and used a different color for my notes and underlining. For a while I was underlining in every book I read, but as I started selling more and more of my books, I realized that you get significantly less money for books that are marked up, or they will not be purchased at all. So I started writing only in school books, or really meaningful or life-changing books. I also always underline with a ruler so it will be neat. The second thing I do, in part because I have a lending library, is stamp my name on the spines of my books. I currently have 56 books lent out. By having my name on the spines, if it sits on someone else's shelf for a while, someone will see the name and say 'Hey you have Steven's book here'. I now get about 85% of the books I lend out back. Before I started this, I averaged around 40%. I previously put bookplates on the inside of the book, but the stamp on the spine was recommended by a professor back at Queen's and it resulted in a lot fewer books having to be repurchased. Taking care of your books. I am pretty meticulous about how I treat my books. I have some paperbacks I have read 3 or more times and still have not broken the spines. When buying used books I will not purchase them if the spine is broken. I also take dust covers off of hard covers when I read them in order to prevent them from being torn or damaged while in my backpack. When reading, I use cue cards as bookmarks. I write down notes for reviews on the cards. Also any words that I do not know I write down and look up their meanings. My record was a Michael W. Higgins Book. I filled 3 large cue cards, 1 word per line, while reading his book Heretic Blood. Most of the words were either old English or old French words. So how do you treat your books? Drop me a line and share your habits and strategies. There is a story I heard years ago, I do not know if it is true or not. However, a guy notices that his neighbor has cleaned out his garage, and can now park both cars in it. Previously the doors barely closed because of all the old stuff. The neighbor asked 'Did you find anything worthwhile?' The guy responds, 'Not really; there was this old bible from Guttenberg. But some guy named Luther had written all over it so I threw it out.' And as always you never know what you will find between the covers and whom it might be from. It's the end of the school year and Hank Zipzer is back in trouble again. Not only did he get three D's on his report card, he managed to get the whole report card mixed into a sample batch of his mother's soy salami. Oh me, oh my, what a pickle for Hank and for his mother's deli The Crunch Pickle. At first Hank does not think this is such a bad thing because he believes the batch of Salami is bound for the garbage can, but then he discovers it is heading to a tasting for an owner of a grocery chain. Salami full of report card cannot taste very good. He has to do something but does not know what. In this book Hank is diagnosed with learning challenges. He also admits it to himself and others. It is also the beginning of a plan to develop strategies to help him overcome his disability. This is another great adventure for the Zipzer, and will be for you and your children also. I have been working on adding labels to my posts, I have been thinking about it for a while but have just not got around to it. Last week I finally started. I was hoping to get a label cloud going but I can not seem to get it working on a self-hosted blog. 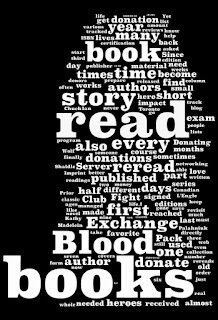 I did find a site called Wordle that will read your feed or article and create a cloud based upon it. Here are some images of my cloud. This was on the wall in the classrooms at triOS College where I did my college diploma in IT. I asked a teacher for a copy and have one up in my den at home and one up above my desk at work. It is a great tool to help you in preparing for certification exams, if it is your first or 21st exam, I still find it helpful to review regularly while preparing for certs. The following are concepts and ideas that will help the student prepare for a certification exam. This is to be used in conjunction with hard work and studying, not as a replacement. 1. Read the questions and answer it if possible before reading the answers supplied. Most exam questions are designed to confuse the student who does not know the answer. The problem with this technique is that it also confuses students who are nervous or who have low self-esteem, even though they know the answer they will quite often select the wrong answer. 2. While answering the questions, be sure to identify why the answer is correct or incorrect. This makes each question valuable as a learning tool. It may be time consuming when you first start but it will be worth the investment. You will turn each selection into a learning experience. 4. When answering scenario questions, read each "Required" choice and determine in a word or two what is needed to meet this requirement. Repeat this with the "Optional" statements. As you read the "Proposed Solution", identify the required and optional statements that are met or not met. 5. With large questions, always read the statement with the "?" first. Determine what is being asked and then read the rest of the question and pick out the relevant information. This avoids re-reading the question numerous times, which can be time consuming and confusing in the long run. 6. The exams are timed, so if you come across a question that you are unsure of, mark it and come back at the end. Quite often there are questions further on that may answer the one you were not sure of. 7. Never change your answer. Students tend to select the correct answer, doubt themselves and change the answer to an incorrect answer. If you choose it to start with, even if it was subconscious, there was a reason for the choice. 8. If you are unsure of the answer, most times you can narrow it down to two through the process of elimination. 9. If the question is asking about commands that can be run from the command prompt and you are unsure, the commands never exceed the DOS naming convention of 8.3. 10. Do not be afraid to write things down, even simple things can be forgotten under pressure. Draw the question as it is being described, visual representations always help. On a disappointing note Nexient Learning Center Kitchener just canceled all exams for the next 5 weeks. With no notice, I was scheduled to write an exam tomorrow but received a call from Prometric stating the testing center is closed without notice, the closest testing center is over an hour away. Nexient had already closed Fridays for the last 2 months, and had a week shut down. I hope this is temporary and not the death throws of Nexient in Kitchener. triOS had closed their local testing center over 18 months ago to turn the space into classrooms. My daughter likes this show even though we do not catch it much. This book is a great adaptation of one of the episodes. 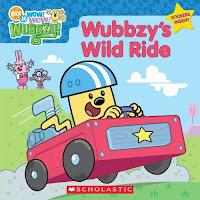 It is the story of Wubbzy's plan to win the big race and get free ice cream for a year. But when his racer breaks down on his test run he gets his friend Widget to help improve it. However she keeps improving and improving and the day of the big race has some interesting results. It is a book about friendship, and learning when enough is enough. A great tale and fun to read. Help! Somebody Get Me Out of The Fourth Grade! This series gets better and better. In this adventure, Hank sneaks a peak at the teacher's register and sees 'redo' beside his name. Now he is panicked; he is going to have to repeat the fourth grade, and be in the same class as his brilliant younger sister. But rather than asking adults he trusts to help him figure this out, he devises his own plan. His plan includes getting his parents out of town so they will miss his Parent Teacher Interview. His plan is elaborate. First he needs to forget the slip two days in a row. And he wins a trip for them to Philadelphia to catch a Rock concert. Now his mother wants to rock, but his father who collects mechanical pencils and does crosswords, has no interest. Will he get them to Philly? Will they miss the parent teacher interview? Will he make it out of the 4th Grade? Read this wonderful story to find out. I have said it before but as someone with Dyslexia these books are eerily haunting. It is like reading a piece about my own childhood - my struggles, failures and successes. These books are meant for a younger audience but they are great for anyone who struggled with learning difficulties, even if diagnosed as an adult or university student. They are also great fun for a family to read together, or for those who know people with these special needs. The process of weeding out the library. Once upon a time I believed that I needed to keep every book I read; I also wanted to own every book that I read. It soon became obvious that this was impracticable, as well as not feasible and practically impossible. This leads to both the need to purge books, and the pain of purging books. I have purged on many occasions, but it is always a bitter sweet situation. I have sold books when I needed space, when I have needed money and sometimes just because of changes in reading habits. Currently for me, purging is a little less painful for a few reasons. First I do receive over 100 free books a year because of the number of reviews I write and publish, here in Imprint and elsewhere. My blog receives about 500 hits a day and I have publishers and authors contacting me regularly asking me to review their products. Second I also now have an e-book collection. 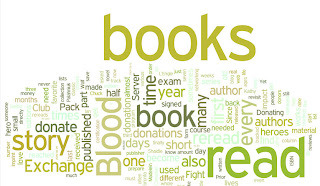 I have over 20,000 books in electronic format that I have collected over the last decade or so. These books are sorted by author and genre, and can easily be carried on a jump drive or put on my laptop and read at leisure. I enjoy the e-book format because it is easier to carry multiple books, and because I can reread old favorites anytime I want without having to keep the physical book. But back to the topic at hand - the need to purge physical books and how to go about doing it. As an example, when I got married I had about 10,000 books in my library; currently I have about 5000 and of that 5000 only about 100 are books I owned when I got married. If I still had every book that I have owned and read, I would need a second or third house just for the books. So not purging is not really an option, but since it is painful, how does one go about parting with his books, his treasures, his friends? Well here in Waterloo I do it a few ways. If I am selling because I need money then I usually pull out all the books I am willing to part with and pile them on my den floor, then I go back through the shelves and pull out the sacrificial books. These books are ones that I have had more than two years in my 'to read' pile but have not read yet, books I intend to read but just have not made a priority, or books I have started but never got around to finishing. Then I pull out the books I know will bring the most cash. If I am just selling to make space, then I skip this final step. Once I have all the books pulled out, I load them into boxes and hockey duffle bags. Then the travel begins. First I take them to Old Goat Books on King Street. They are a little more picky about what they will take, but pay prime dollar for used books, and are great guys to deal with. Next I hit the Bookworm on University; anything that Old Goat did not take comes here. They tend to take a good percentage of the books, and even some of the Advance Reading Copies I get from publishers. Next I hit A Second Look Books in Kitchener. They take almost anything a nd in any condition but do not pay nearly as well. By this point I am usually down to about 10% of the books I left the house with, and these go to the Generations Thrift Store in Waterloo. I now have a policy that if I pack up a book to sell, it does not need to come back home. Then I get to go home with some extra cash, empty bags, and get to reorganize my den and have spaces on my shelves again, and room for the new books that I receive almost every week to review and get placed in the 'to read' queue. My office always feels cleaner and fresher after a purge, because by the time I have the need to purged, I usually have every shelf full, some with double rows of books or stacks of books on tables, and the front of shelves. Then after the purge there is space again, usually a full empty shelf, and spaces on the ends of other shelves. So once all the books are sacrificed the space becomes reorganized and is free of clutter at least for a few months. Hopefully those tips will help you during your time here at UWaterloo, either if you need to purge because you need the money, the space, or it's just time for a change. Then someone else can find what's between the covers. Note: You can see more pictures of my old den here, and my current den here. These pictures are after a major purge and reorganization, about 300 books were culled. Today the shelves are filled to overflowing again and it has been less than a year since these pictures. This book was a team effort from the Solid Quality Learning team. The authors include: Daren Bieniek, Randy Dyess, Mike Hotek, Javier Loria, Adam Machanic, Antonia Soto and Adolfo Wiernik. In my experience, sometimes group projects like that fail because of too many hands in the pot. Not in this case. This book is excellently written. 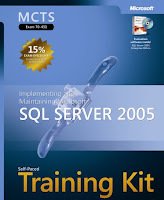 The Self-Paced Training Kits (SPTK), are designed for just that - for a person to be able to buy it, and work through the material, either to prepare for the certification exam, or because they want to deepen their knowledge of a product, to either be more proficient in their job or to advance their career. This book will help reach all of those objectives and more. At nearly a thousand pages it is chock full of information to absorb; fortunately it is structured in such a way as to make that possible. Each chapter begins with a brief introduction of the concepts to be covered. Each concept has its own section. Then there is a great lesson Summary to review and highlight the objectives of the chapters and what you should now know. Then there is a written review, both theoretical questions and practical case studies. The software on the student CD, has self tests, that can be used for chapter review of certification prep. They can be used both in a learning mode or exam mode. 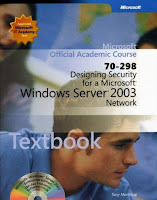 This book was used in the Microsoft academy that I attended. It is a great resource that I am sure to reference for years to come. This book is a great resource. I have enjoyed all the MOAC textbooks I have used in school and in preparing for Computer Certification exams. These books are well laid out and packed full of features to help maximize learning. The key features in this series are: first, all chapters have a concise learning objectives at the beginning of the chapter. Second, the body of the chapters has practical exercises, and these exercises are further supplemented by a Lab Manual. There are also three reader aids throughout the books that help you dive deeper (to really get to the core of the concepts presented.) They are: Notes - Real world examples, Important - Essential information reinforced, and More Info - Cross reference material for additional resources. Then each chapter has short hands-on exercises, end of chapters review with a variety of exercises and case studies, and the chapter summaries that reinforce and confirm the key concepts of that chapter. If you take the time to work through all of the material you will have a great start in your preparation to write the exam. Combine that with the practice exams on the student CD and you should be set to go. What I love about the MOAC books is that they come with trial versions of the software, so you can build your own labs either real or virtual to play with the software. It also has a PDF of the textbook on the Student Files CD-Rom. I have built a resource library of all the tech books from writing certification exams and keep it on a thumb drive for easy access at work, or in the field. A great guide well written, and easy to use. Well done Tony Northrup. The Fancy Nancy books were recommended to us by family for our daughter, to help her develop her vocabulary in a fun, funny and witty way. Wonderfully written and excellently illustrated this book is both a pleasure to read and look at. 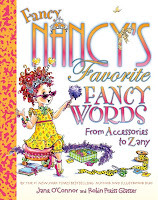 Fancy Nancy in a sweet charming way introduces young readers to big words, but in such a way that the children will remember and be able to use them. What a wonderful little book. I cannot wait for more Fancy Nancy to come into our hands to read together. I was asked recently why I work so hard on certifications. To be honest the answer is multifaceted. First I have been in University 20 years, I love school and I love learning. Second, after I was injured at work, and retrained for IT, I had numerous computer Certification coupons/vouchers that were bought for me and I feel obligated to use them before they expire. Third I don't sleep much and haven't in years most nights I go to bed around midnight, get up at 5 and am at my desk at work between 6 and 630am. Between studying, freelance writing and spending time with my kids certification keeps me learning and growing my skill set. Even if I was independently wealthy and did not have to work, I think I would still work on computer certifications. I enjoy the learning, I enjoy studying. I am already planning the other 2 upgrade exams from MCSE to Server 2008, the three Windows 7 Exams, and then some RIM Blackberry Exams. I just love learning and I love certification, I am a Certification Junkie or Addict! If your enjoying this series you will probably enjoy the Microsoft Born to Learn blog. But so far I have written 23 Exams in 20 Months to achieve 22 Credentials. 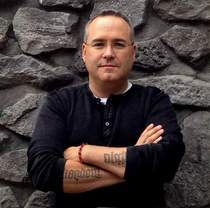 My Updated Certification Schedule, at least at the moment, it is always open to change. These exams were written either at a Prometric Testing Center or at a Certiport Testing Center for the Office exams. The Exams names that have links link to reviews of the books I used to prepare for those exams. 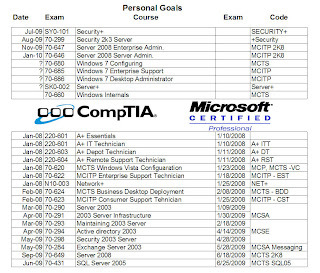 These exams are a mix of CompTIA exams and Microsoft Exams.